Over eight inches of snow had fallen that February Saturday during an already snowy winter. Outside was very cold, but the snow-covered landscape was beautiful. I hadn’t had the chance to take in any of it; I was an eighteen year old high school senior and waist deep in homework — a term paper, assorted upcoming tests, and another paper on the poet Wordsworth — not exactly the most exciting way for a teen-ager to enjoy the week-end. That evening, Dad came home from work, and as he walked into my room to say hello, he plopped a very long black-and brown object on my bed. The object had beautiful brown eyes, floppy ears and a long tail. “This is your new dog,” Dad said with a smile. “Oh, Dad,” I groaned. I wasn’t happy about this new visitor — Mom’s allergies to animals precluded us ever owning a dog. We knew that there was no point in getting attached to any dog Dad brought home, as this adorable little puppy would doubtless be gone the next day, to a home where she wouldn’t cause sneezing and sinus headaches. Still, we were immediately taken with the new visitor. 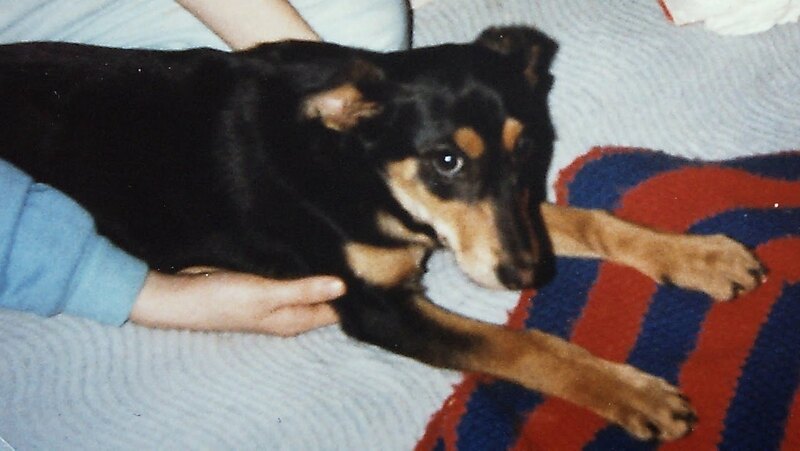 She was clearly very young; based on the time she lost her baby teeth we would later be able to determine she was probably not more than ten weeks old the night Dad brought this little Doberman/shepherd mix home. Surprisingly, the shy puppy who Dad named Brandy was still with us the next day. Mom and Dad explained that they were looking for a good home and didn’t want to turn the puppy out into the cold. A week after Brandy’s arrival, Mom and I were on the way to church, and Mom was going on about something funny the dog had done that day. I realized that during the past week, Mom had been very vocal about her affection for Brandy, and suddenly the reasons we hadn’t sent the dog away became clear to me. “You’re thinking of keeping Brandy, aren’t you?” I asked Mom. And with that, Brandy became a member of the family. Brandy soon met Nana’s dog Sandy, who we called her “cousin” Sandy, and the two spent the next few years scrapping and playing. Our question of “Brandy, want to go see the cousin?” would send Brandy into an insane frenzy, as she yapped, cried and raced around to the door. Brandy and Nana’s dog never stopped running around the entire time they visited. We got tired watching them. Owing Brandy was like living with a permanent two year old. A typical Brandy exchange started with her trying to get my attention — I’d be doing homework, when Brandy would come over to where I was sitting and start whimpering and nuzzling me with her nose. She wanted to play. Sure enough, I heard another long sigh, and the thump of the dog jumping off the sofa. That would be followed by: squeak, squeak, squeak! Brandy had more toys than most children — dozens of little plastic bones, hamburgers, and bunnies. All made that silly squeaky noise, and Brandy was never satisfied until the helpless toy had been rendered silent and shredded into confetti-sized pieces. When I did have time to play, my question of, “Do you want to go outside?” was answered by all hell breaking loose as the dog went crazy, yapping and yipping. In the yard, she zipped around, running in circles, daring me to chase her. She’d explore everything, from burrowing under piles of leaves, to digging little holes to chasing birds — a little canine perpetual motion machine. On Brandy’s first birthday, Dad decided to throw her a party. The “cake” was a pint of Brandy’s favorite ice cream, with a thin beef jerky as the candle. The attention made the dog really nervous; she’d assumed she’d done something wrong. My sister Theresa’s act of placing a little party hat on the dog’s head didn’t help either — I thought Brandy would shake herself apart. Brandy slept at the foot of Mom and Dad’s bed on the little “fleece” mat that Dad had made for her. Dad really loved the dog, and she was great company for him throughout his battle with cancer. My mom, Theresa and I would be out at school and work, and if a visiting nurse wasn’t there, Dad would’ve been alone except for the dog. She often made Dad smile — something he didn’t do much anymore. After Dad died, it made a huge difference for us to have Brandy waiting for us when we got home. Braving that now empty house was made easier by the tail-wagging, bright-eyed little ball of energy who was always happy to see us. She’d squeal and whine and run all around, and that always made us feel better. In a way, she was part of my father’s legacy — a connection to Dad’s memory. Brandy was great to travel with in the car, so any vacation Mom took to New Hampshire, Brandy was there. Our mountain home has countless Brandy memories, of her barreling through the tall grass, running at speeds no human could match, and her plummet into a river that activated her swimming instinct. It was amazing — a dog who’d never been in water immediately knew how to swim. Brandy had dozens of little personality traits that wouldn’t really mean anything except to the family, but are remembered so fondly: Her pure terror in receiving a bath (she was convinced she’d done something wrong), and her finicky attitude toward food. I remember how she picked up on my emotions and always seemed to know when I was feeling most down — that was when she’d just walk over and plop herself down in front of me. I remember how Dad taught her that the word “cookie” meant “a special treat” and how we had “bologna cookie,” and “ice cream cookie,” and so on. I remember countless nights coming home after midnight from a date or work, and Mom would have Brandy outside to meet me. I remember how much I loved that little whinny whimper she made, and how excited she was to see me. A few paragraphs can’t begin to sum up how important one little dog was to our family. She was a fixture in the house, and in her prime she had absolutely boundless energy and an incredible amount of love to share. But in the last two years, Brandy began to fail. It was subtle at first, but her hearing started to go, and she was losing weight despite the fact nothing was medically wrong with her. The spark in her eyes grew cloudy. Over the last year, she began to develop terrible arthritis, and finally couldn’t accompany Mom on her nightly walk. Later, she couldn’t even follow Mom up the stairs. On a recent trip to New Hampshire, we were all dismayed to see how badly the poor dog had failed, and she just about reached the point that she had to be carried everywhere. No medication the vet could prescribe would relieve Brandy’s pain, and he suggested that it was time to put Brandy to sleep. might have to put Brandy to sleep” — and the actual act — are worlds apart. On that recent Wednesday morning as I met Mom at the animal hospital, as Mom and I cried and patted Brandy, Mom said she felt that we’d waited too long to do this; after all, even the vet had recommended it months ago. But I didn’t agree with that — we needed the time to say good-bye, and Mom had made the dog as comfortable as possible. Still, all I could keep thinking was, “Oh my God, we’re killing Brandy,” as fifteen years worth of memories came flooding back at me. But the dog was in terrible pain, couldn’t even eat anymore, and was suffering. For a dog we loved so much, to allow her to suffer more would have been wrong. Yet somehow, even knowing “it was the humane thing to do” brings little comfort. We’ve all lost people we loved to death; and as I grow older I find that most people are hurting about some aspect of their lives at one point or another. I’m not trying to give an animal more value than the life of a person, yet the loss of a pet, to many people, is the loss of a beloved family member. Brandy was that to us, and her death hurts. It hurts a lot. I go to Mom’s and see the place where the dog dishes should be, or look at the chair Brandy liked to sleep behind, and feel bad. There are memories of her everywhere I look. Yet part of me realizes that to have a dog for nearly fifteen years — and one that really made such a loving difference in our lives — was truly a blessing and I should be grateful for that — and I am. “Just a dog,” some might say. No, not “just a dog,” but a beloved member of the family who brought more love and joy to the family than you can imagine. Rest in peace, little Brandy. You will be missed.